In partnership with the Forest Heights Community Association, Forest Hill T-Ball would like you to join us at the Forest Heights Community Centre (1700 Queen’s Blvd.) 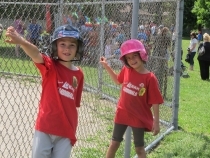 on Saturday, June 15th from 1:30pm - 4:30pm to celebrate the end of another successful T-Ball season. Our 2019 season begins Monday, April 29th. Register now and join in the fun! Copyright © 2019, Forest Hill T-Ball Association.